1 cup whole oats rolled or instant.... rolled oats makes it chewier. Place sliced peaches in an 8 in x 8 in glass baking dish. In a small bowl, combine 2 tsp brown sugar and 1/2 tsp cinnamon. Sprinkle over peaches and gently stir to coat peaches with cinnamon sugar. In a medium-sized bowl, combine oats, granola, 1/2 tsp cinnamon, and 1/4 cup brown sugar. Sprinkle granola mixture evenly over peaches. Evenly slice butter on top of granola mixture. Baked on middle rack for about 20 minutes until top is golden brown. Serve warm! Ooh granola on top! Love that idea!!! This looks pretty delicious…minus peaches. I’m allergic. Do you you think it would work with apples? I love that you use granola! Apples would be pretty tasty too! Try it out and let me know how it goes. Granola on top?? Who would have thunk! 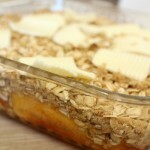 I love peach crisp – like LOVE it!! The granola makes it even ‘crispier’! Let me know how it turns out.